"Howdy from another sailing dreamer"
Last weekend, when Nan and I were in Denver for the Coldplay concert, we met Paul and Honey Caouette on Saturday morning for breakfast. Paul had contacted me by email a couple of months before based on a posting he read on a Valiant owners group website about my experience with "Sea Hawk," the Valiant 40 I looked at in Fort Lauderdale (Boat Quest, Part 7 and Boat Quest, Part 9). In his message, Paul said that they lived in Denver but owned a Valiant 40 in Miami, and he was wondering if I would be interested in helping them sail the boat to Spain next May. The four of us hit it off well, chatting about everything from John Irving's books to sailing, of course, to Paul's acting in community theatre, all in the course of a breakfast at Dixon's in LoDo that stretched to almost three hours. Paul told the story of how he had come to own a well-equipped 1977 Valiant 40, the result of his winning an IRS auction. That was almost five years ago. Since then, he and Honey have sailed "Wild Iris" (formerly "Chanticleer") up and down the Florida coast and across to the Bahamas for an extended cruise. They travel to Florida every couple of months to check on the boat and take her out for a sail. She is currently swinging on a mooring in Key Biscayne. Now Paul and Honey are ready to sail across the Atlantic, with the idea of touring the coast of Spain and exploring the Mediterranean. They are hoping to set sail in May: "Anchors aweigh on the seventh of May," as Paul puts it. The idea is for their departure to correspond with Paul's official retirement, but given current economic conditions, he's keeping his options open. Regardless, the plan is in the works; they just need to sign on additional crew to make it a safe and pleasant voyage. If it were up to me, I'd say sure, let's join them on their trans-Atlantic passage, but Nan is less confident. It's at least a three-week commitment depending on the weather conditions, and they will be unlike anything we have ever experienced. So I don't blame her. Near the end of breakfast, Paul and Honey invited us to join them when they go to check on the boat in mid-January, and that might be a good time to see if we're really up to the challenge of making the passage with them. Stay tuned. 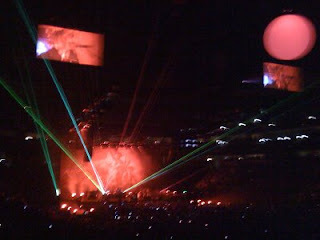 Back then, their stage show was almost spartan, with just a single screen of bright lights behind the band and the usual colored spotlights up above. 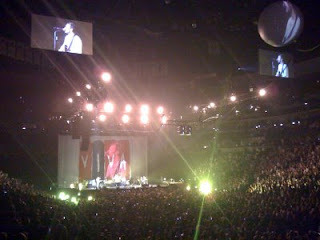 This time around, on their Viva la Vida tour, they expanded the show to include almost the entire arena. 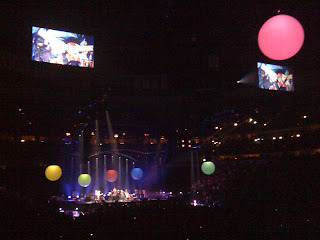 The stage featured wings extending out into the audience on both sides, there were projection screens about halfway back so the cheap-seat crowd (like us) could get a better view, and there were large spheres hanging from above with projectors inside that showed everything from images of the band to simulations of a cloud-covered earth. The light show was also greatly enhanced, with lasers and bright spotlights projecting out into the audience. The overall feeling was one of inclusiveness, like everyone there was not just a spectator but an active part of the show. This was especially true when the band used the stage wings as mini-stages for the whole group to gather for a song, or sometimes just for Chris Martin and his piano to play a solo number. At one point, the band members set down their instruments and rushed up the aisle and then up the stairs to a back corner of the stands, where they picked up guitars and mandolins for an acoustic performance of "The Scientist." 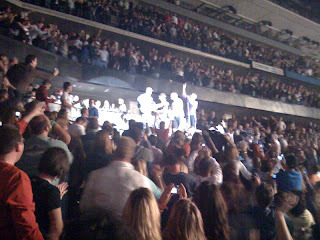 Unfortunately, the lights were so bright that I couldn't get a decent photo using my iPhone, which has a pretty crumby built-in camera, but regular cameras were not allowed so it was the best I could do. 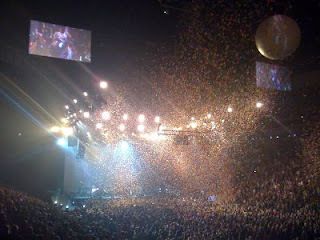 The confetti that fell near the end of the show was actually colored paper in the shape of butterflies. It fluttered magically in the lights to the end, finally settling in time for the single-song encore of "Yellow," Coldplay's first big hit from their 2000 album, Parachutes. It was a magical show, and it prompted me to download Coldplay's follow-up EP, Prospekt's March, earlier today off the iTunes store. It's a great musical complement to Viva la Vida and will keep us thinking about the concert for many weeks to come. I live in Seattle with my wife Kelsey and newborn son Harmon. We got married last year. We started dating a couple years before that. I'd been trying to avoid any entanglements because I was moving to Fiji to try to start a tourism business. I'd visited before on vacation, and had local friends. The plan was to partner with a village and do "survival tours," basically camping on the beach and learning to climb coconut trees, spear fish, and start a fire without matches. I didn't know if we'd target Jeremiah Crusoe wannabes (like myself) or wave palm fronds over Thurston Hemingway wannabes (like myself) and do catered lovos (Fijian luaus) but figured there was a market for both. This was to be a scouting trip, where I'd get some contacts lined up, and then come back to arrange financing and market it. It didn't work out quite right, partially because I was lazy, and partly because I realized it was a bigger project than I thought, but the biggest problem was that I fell in love right before leaving. Kelsey got me to promise I'd come back, and so after three months I did. While in Fiji, I realized I'd need a boat, or partner with someone who had a boat, so I went to the Royal Suva Yacht Club looking for contacts. On the bulletin board there I saw a posting for a crew-wanted position to Australia. Taking this as a hopeful "in," I contacted the skipper by email. It turns out that the autopilot was broken and he needed helm watches. I'd never sailed before, but convinced him I could do it. In Fiji they have a saying, "Fiji Time," which means essentially "whenever." While tourists might get frustrated with "Fiji Time," I learned it's nothing compared to "Yachtie Time." Long story short, I spent several weeks waiting for the boat to finally leave, after picking up extra crew and eventually even getting the autopilot fixed. In the meantime, I became friends with the skipper, Alan Toone, and another sailor, a young single-hander from England, Tony. I sailed around Fiji with Tony, and helped him get a few paying crew that helped him buy enough food and fuel to make it to New Zealand. Finally, I went with Alan to Australia, buying a surfboard in Fiji that I lugged around, planning to use it for a couple weeks and give that country a proper tour. By the time we got to Brisbane, there was only enough time to clear customs, sleep on the boat, and catch a taxi to the airport the next morning, stopping at a thrift shop to buy a sleeping bag and some tape that I used to wrap the surfboard in to take on the plane. I learned a little about sailing, and developed some friendships, but hadn't spent much time doing what I planned to do, and besides, I was hooked. Unfortunately, I only had a little over a week left in Fiji. I made the most of it. Finally got to one the outer islands on the local freight ship and stayed with friends, and even got in a day of surfing (or rather, floating outside the break, being intimidated by the surf.) I caught a fish on the boat ride back though, and we had a couple of really good lovos. Apart from a confusing mix-up with the daughter of my host, it was a great time. I returned to Seattle, Kelsey picked me up at the airport, and I remembered I loved her. I got another job doing what I hated, but tried to make the most of it and sock away money for a boat. I tried to sate my appetite with a Hobie cat on Lake Washington, but Kelsey took most of my time. I heard from Tony, who'd washed up on the beach in Australia after a storm and dead engine, but minimal damage, and no complaints. He met an American girl down under and plied his trade through Oz, Indonesia, and Thailand. He was looking to sell his boat, a Cascade 42, and I wanted to buy it, but had about $5000 less than he needed. I thought about getting a cash advance on my credit card, buying a plane ticket and a bag of rice when I got there, and trying to sail backwards across the Pacific, but instead I got married two months later. Kelsey knew my plans, and had agreed to them, even taking sailing lessons and chartering with our families in the San Juan Islands the year before we got married, but she had her own dream: Ecuador. Before we were dating, she'd spent a year in Ecuador as a volunteer at an orphanage. We've been back for Christmas a couple times, taking gifts to the kids and visiting friends. On one return trip we spent a few days in Florida, visiting the Everglades, the Keys, and the King Tut exhibit in Ft. Lauderdale. We learned two disappointing facts. She gets seasick (discovered on an amazing Sail-fishing trip off Key West), and the King Tut exhibit was a sham. No gold tombs, or even a facemask. Re-created artifacts and artists' "conceptions ," and a lot of large cardboard posters. After paying something like $60 and waiting in line for 3 hours. I can't believe there wasn't a riot from dissatisfied museum-goers. Anyway, we got married, I spent all my time shopping for boats online, and one day while she was away at a work conference, she called me up. She listened patiently to me describe the newest boat I was interested in (a Wauquiez 32), and then announced that she wanted to move to Ecuador and start a program for the orphans there. One for childhood development, and another for troubled teens. I said sure. So four months after getting married, I quit my job again and we moved to Ecuador for 6 months. While she worked with the kids, I worked on a business plan. I do software testing and web development, but always get testing jobs, and do a little development on the side. I'd finally decided I'll try to develop testing tools. I'd reconciled myself to a career, but wanted to be my own boss, and more importantly, wanted to have an income that I could generate from anywhere. I made some progress, and tried to recruit some local talent, but the pool was small, and I didn't speak Spanish. Well, one day at the end of January, we found out the news that she was hoping for. She was too sick to do any work for the next few weeks, so we went home a bit early. And I got another job. On October 24th, 2 weeks late, she had a 10 pound, 12 ounce baby boy. We called him Harmon after my grandfather. Of course, I'm practically out of money now, and my priorities have changed, but I hope in the next couple years we'll ready to sail away. Back to Ecuador, to Fiji, to the Mediterranean, and of course, everywhere else. I owe my dad a trip up the inside passage to Alaska, too. I'm chomping at the bit to try and get my own business going, which I feel has real potential, but there's the thought that if I take the risk, I could set the boat back a few more years. 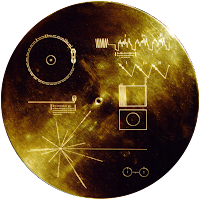 On the other hand, if it succeeds, it could make the dream a permanent reality. A high speed satellite connection would only be around $15,000 extra and maybe a thousand a month. That's less than I pay on rent now. Or we could park the boat every few months, and at the very least I could get a contract job. Anyway, that's my story. It's a foggy day, but I can just see Puget Sound through the window behind my back at work, and the winters are long and rainy here. I represent Virgin Money and am spreading the word about the latest and greatest happenings. I came across Whispering Jesse, saw that you were a sailing/boating enthusiast, and thought you this news would pique your interest! Sir Richard Branson, Founder of The Virgin Group, set sail early this morning with the America’s Cup Challenger, TEAMORIGIN. The squad will be attempting to break the transatlantic sailing record from New York to the U.K., which currently stands at 6 days, 17 hrs, 52 minutes and 39 seconds, to become the indisputable fastest mono-hull sailing yacht to cross the Atlantic. The Virgin Money yacht is equipped with the finest and most experienced crew. Coming straight off gold medals in Beijing are Ben Ainslie, Lain Percy, and Andrew Simpson. Sir Richard Branson will be blogging daily so you can follow the adventures right alongside the Virgin Money boat. Check out the following site for information and updates! If you’d like any additional info about the challenge, or about the Virgin Money company, please feel free to let me know. The whole crew at Virgin Money is excited to take on such an adventure and hopefully you will be too! Virgin Money helps people access affordable and flexible credit, offering unique financial services and a customer experience that most banks cannot match. The main idea being that you can now formally borrow money from your friends and family, while Virgin Money lends a hand in the process. With money from friends and family, you can pick your own interest rate and loan terms to best fit your situation. Rather than giving interest to a bank, you can keep it in the family – often adding up to thousands of dollars of savings. What could be better? "After approximately 2 days and 4 hours at sea in the face of impossible odds the crew of Virgin Money had to admit defeat on their first attempt to set a new world record for the fastest mono-hull crossing of the Atlantic Ocean. After 2 days that saw the crew and Virgin Money overcome seas of 40ft and gale force winds of between 7 and 9 their dreams were finally dashed when a 'monster wave' took out the spinnaker, washed a ten man life boat overboard and ripped a huge gash in the mainsail." 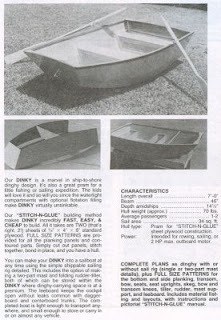 I flipped through the catalog and quickly found the plans that Phil had ordered for building a plywood dinghy, "Dinky," for his trawler in the Bahamas. 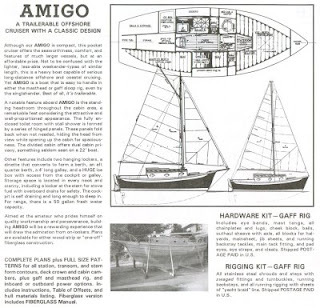 I flipped further and found my dream plans, for the "Amigo," a fiberglass or strip-planked wooden 28-foot sloop (22 feet without the bowsprit) that I thought I could build in a large garage. Looking back on my thinking of that time, I have to ask, what was I thinking? Build a large, heavy sailboat in seriously landlocked Colorado? Even if I could complete the project, how would I get the thing to water? The plans call the Amigo "a trailerable offshore cruiser," which is an oxymoron if I ever heard one. The listed displacement is over 5000 pounds! Forgetting the trailering idea, it would probably cost more to transport the boat than it would to buy a modest fiberglass fixer-upper in a coastal area. 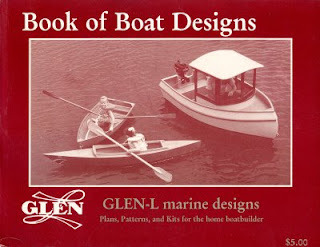 That boat-building dream was even more fanciful than the circum-navigation one. No wonder it soon gave way to the obsession with the MacGregor 26 and the other boats that followed. But, you know, if I ever do get a boat, it's going to need a dinghy and nothing says that that dinghy needs to be an inflatable. Maybe I should put the catalog away in a safe place, just in case. Before we left for Mexico, I placed an Amazon.com order for the book recommended to me by "Melissa" in a comment to the first of these Circumnavigation Routes posts, Chasing Sunsets: A Practicing Devout Coward's Circumnavigation by Lawrence Pane. 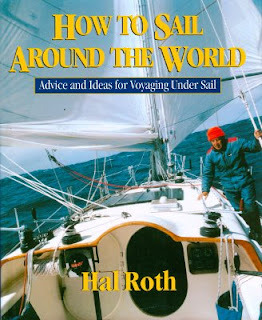 While I was at it, I also ordered Hal Roth's How to Sail Around the World: Advice and Ideas for Voyaging Under Sail, which I have wanted since browsing through it in a bookstore a few years ago. Vacations are great opportunities for "power reading" and I had planned to spend many hours reading Chasing Sunsets. 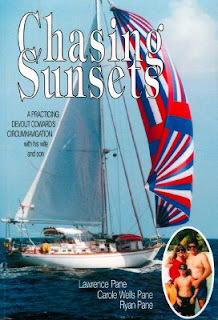 The book tells the story of the Pane family, Lawrence ("Laurie"), wife Carole and son Ryan, who set sail on their circumnavigation from Marina Del Ray, California in March, 1996 aboard their 1987 Mason 53 center cockpit cutter, Dolphin Spirit, and arrived back home in April, 2002. It sounds like a great premise, but I found myself starting to lose interest only sixty pages into it, for a number of reasons. The book lists Carole and Ryan as co-authors, and the narrative is liberally sprinkled with their comments, as italicized asides in their own words. I found this format to be distracting, especially since many of the comments added little to the story aside from a slightly different perspective on what Laurie had just presented. Carole's comments tended to create a less than positive image of her personality. She was a reluctant participant in the adventure and lets the reader know this, repeatedly. I found myself thinking: you're doing something most people only dream of; you're doing it with your family, which includes a husband who is a safe, competent sailor; you're doing it on a large sailboat that features every conceivable convenience; and you're doing it while sparing no expense. What is the problem? Another complaint I have is that the Pane family's voyage seemed unrealistically luxurious, way beyond the financial reach of most people and therefore difficult to relate to. The nine-year-old, fifty-three foot, totally tricked-out sailboat? Laurie mentions that it was paid for before the trip began. He politely doesn't mention the price, but a boat like that must have cost at least $500,000. Six years without substantial income? Laurie estimates that the trip cost about $40,000 a year in expenses, or $240,000 for the whole trip. It all adds up to a lot of money. I would rather read a story about people closer to my own means, people who are sailing their dream in a modestly sized boat while being as self-sufficient as possible, people like Hal Roth, whom I will get to shortly. Even without the comments by Carole and Ryan, the narrative tends to read like a travelogue, with too much "we did this and then we did that" to provide a compelling storyline. After the first two chapters, I started flipping to the back of the book to check the appendices and the color photographs. There I found some good concise information: answers to frequently asked questions, covering everything from the threat of piracy to the best places visited; a complete equipment list, including spare parts; and a comprehensive bibliography listing all the pilot guides and other books referenced during the voyage. As I read the appendices, I recalled that "Melissa" had referred to Chasing Sunsets as a great reference for planning a circumnavigation, and I can agree with that. When the time comes, I might check the book for information about such details as the best anchorages in Tahiti, but for now, I am setting it aside. Hal Roth's book, despite its title, is not a step-by-step guide for sailing around the world. Instead it is a collection of twenty-nine short articles detailing the knowledge that Hal and his wife Margaret have gained over a lifetime of sailing. It begins with the dream of traveling the world and then outlines the advantages and economy of doing it in a sailboat. Hal makes it all seem so romantic and so possible. He favors providence over preparation, encouraging the reader to get out there and sail, not to sit at the dock fretting over endless equipment and to-do lists. Simplicity naturally leads to thrift. For example, Hal sails without refrigeration and rarely uses his boat's diesel engine. But he doesn't skimp on safety, and there are several chapters on "storm management." I didn't read the book straight through but rather jumped from chapter to chapter as interest dictated. One of my personal cruising concerns is about how to handle the necessary paperwork for clearing in and out of foreign countries. Hal dedicates an entire chapter to the process, with plenty of real-life examples. He concludes with a chapter entitled "The Dream and the Reality," some final thoughts and advice on the sailing life, including the admonition to "have some fun every day." While both books made me daydream about sailing away, only Hal Roth's book made it seem like a practical undertaking, an adventure that could begin right away instead of an expensive fantasy for some distant future. Excellent advice and an encouraging tone make How to Sail Around the World a book that every sailing dreamer should have on his shelf. Like there was ever a doubt. Or at least that's what we tell ourselves after a wish becomes reality. But the anticipation, the not knowing, makes our stomachs hurt. That's how I felt yesterday, Election Day, while waiting for a moment I had been expecting for four long years, since the 2004 Democratic National Convention, when Barack Obama was introduced to the world through his keynote address. Something bad is going to happen, I kept thinking. It's too good to be true. But then Ohio turned blue and it took only moments to add in the west coast votes to reach a total beyond 270. When those west coast polls closed, it was official. I watched McCain's concession speech and wondered why he hadn't displayed such nobility and candor in his stump speeches. I watched Obama's victory speech and believed, as I did on 9/11, that everything has changed. At odd moments during the day today, I thought, oh yeah, Obama is our new president. And it made me feel good, like the future is going to be just fine. Like there was ever a doubt.